Second report from Mercator Advisory Group’s new Customer Merchant Experience Survey. In our first report, we defined consumer expectations for optimal experiences with merchants. This new analysis explores five broad drivers of shopper experience related to payments: payments choice, ability to use cash, security, transaction speed, and availability of gift cards/digital cards. Mercator Advisory Group’s latest Primary Data report, Payments, ATMs, and Prepaid: How Payments Align with Experience, is based on the company’s new consumer survey, the Customer Merchant Experience Survey. The online survey of 3,002 U.S. adult consumers, which was conducted in February 2018, explores consumers’ merchant experiences as they shop in-store, online, and via mixed channels. The survey was designed with the goal of defining and highlighting consumer expectations for optimal experiences with merchants. This second report builds on the overall experiential analysis of the first and puts shopper’s payments experiences into the broader context of what consumers value most in their merchant interactions. Payment choice and specifically the ability to use cash in-store are of broad concern for customers in the U.S.
Consumers choose specific payment methods by merchant vertical, perceived security, and ease of use online. 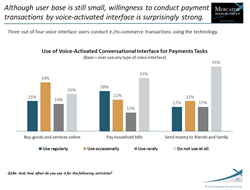 New payment technologies are changing the ways in which customers transact with merchants, including open mobile wallets, voice-activated conversational interfaces, and instant financing at online or in-store checkout. Both prepaid gift cards and in-store ATMs offer opportunities to merchants beyond any fee revenues; they encourage some shoppers to spend more in-store or to visit more often. This report is has 64 pages (in slide format) with 34 exhibits. Companies and product brands mentioned are: Affirm, Android Pay/Google Pay, Apple Pay, Klarna, MasterPass, Siri, PayPal, Samsung Pay, Starbucks, Uber and other major retailer brands. Subscribers to Mercator Advisory Group’s Customer Merchant Experience Survey have access to these reports as well as survey crosstabs, PowerPoint slides of the report exhibits, and the option of requesting custom queries from the survey data. For more information and media inquiries, please call Mercator Advisory Group's main line: 1-781-419-1700, or send email to media(at)mercatoradvisorygroup.com.